Is Your Business Website Lawful? Business website: What should it contain? Your business has a website, have you ensured there are no restrictions or requirements that you should display? If your business operates a web-site which is used to market your business i.e. advertise services or goods or actually sell goods or services online (whether it is to other businesses or consumers), then you need to be aware of, and ensure you adhere to the Electronic Commerce (EC Directive) Regulations 2002. If you are a company you also need to comply with The Company, Limited Liability Partnership and Business (Names and Trading Disclosures) Regulations 2015. Under the Regulations there are requirements to ensure certain information is displayed on your website. Details of any trade organisation to which you belong or if the services you provide are subject to an authorisation scheme, details of the relevant supervisory authority. details of any professional body or similar institution with which you are registered. A reference to the professional rules which are applicable to you. Do you sell goods or services online? If you or your business subscribes to a code of conduct you need to say so on your website and explain to customers how they can access/consult the code. Having the company name and domain name doesn’t fully protect you so you should consider registering your trademark – logo, name or slogan. 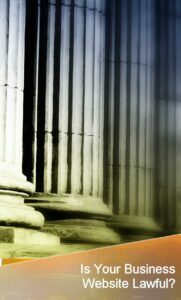 Share the post "Is Your Business Website Lawful?"